For more Christmas Items, go to the Disney Christmas Books, Disney Christmas Music, Disney Christmas Videos, or Disney Christmas Toys and Gifts Pages or the Charlie Brown Christmas (Books, Videos, Music, and Toys) Page . Contains Elmo's World Happy Holidays, Elmo Saves Christmas, and Christmas Eve on Sesame Street. This Sesame Street 3 DVD gift collection is 3 hours of holiday cheer and family fun! Join Elmo and your Sesame Street friends as they learn about holidays around the world in "Elmo�s World: Happy Holidays," see what the world would be like if every day were Christmas in "Elmo Saves Christmas," and bring mysterious fun to life in an enchanting Sesame Street classic, "Christmas Eve on Sesame Street." Always educational and entertaining, the loveable Sesame Street muppets ring in the holidays with a fun-filled version of Charles Dickens's classic A Christmas Carol. Broadway actors Tim Curry and Kristen Chenoweth lend their voices to this charming adaptation that finds the perennially cranky Oscar the Grouch visited by the ghosts of Christmas past, present, and future. This Emmy Award-winning musical from 1978 explores an age-old Christmas conundrum: how does a big guy like Santa Claus squeeze down all those narrow chimneys? When Big Bird and his Sesame Street friends set out to find the answer one Christmas Eve, they explore a variety of amusing theories and learn a lot about the meaning of Christmas in the process. You won't want to miss seeing all your favorite Sesame Street characters as they take to the ice at a nearby skating rink. Perhaps the most enjoyable feature of all is the wealth of wonderful music--everything from traditional Christmas songs to the now famous "Keep Christmas with You" by Joe Raposo. Several numbers are signed in American Sign Language and there's even a brief mention of Hanukkah. This 60-minute, classic Sesame Street special, which teaches kids from 2 to 10 to value giving more than receiving and stresses the importance of love and togetherness, is also thoroughly entertaining. This classic holiday program is pure, utter magic for the whole family. I loved this program as a child, and it remains a must-see for me and my family at the holidays to this day. I (thankfully) grew up in the pre-Elmo Sesame Street era, and this show always brings back wonderful holiday memories. The music is unforgettable, especially "True Blue Miracle" and "Keep Christmas With You". The Sesame Muppets are in true form: Big Bird searching for the secret of how Santa gets down the chimney at Oscar's prompting; Cookie eats a pencil, typewriter, and phone while attempting to make his cookie wish list for Santa; Bert and Ernie take a lesson from O'Henry's "Gift of the Magi" as they give up what they treasure most to be able to make each other happy with the perfect gift, but it's Mr. Hooper who reminds them of what's really important. The ice skating party at the beginning is a gem-especially the side-splitting "snap the whip" scene! And at the end, everyone comes together to celebrate friendship and love, as Big Bird, who had gone missing, comes home and realizes it's not the gifts at Christmas that matter: what matters is giving the gift of love everyday to the people you care about. It's all done without being overly precious or preachy. My niece and nephews love it-I'm happy to see it move on to a new generation in our family. I haven't seen it on TV in years, which is a shame, and my VHS copy was taped off TV years ago and in bad shape, so I was thrilled to see it on DVD. Elmo who? You'll never even miss him. His nervous bundle of hyper-energy would be out of place in this sweet, warm, funny, wonderful holiday program. It's magic. The show opens on a Christmas scene, featuring Maya Angelou explaining to Muppet characters how Elmo once got his wish that every day could be Christmas--and soon regretted it. Charles Durning and Harvey Fierstein are also on board, and there's a new friend in Lightning the reindeer, plus lots of songs. The whooshing Christmas-season feel to the story is infectious. With the help of beloved Elmo, Sesame Street Celebrates Around The World not only entertains toddlers with festive songs and sights, it also teaches children about diverse holiday traditions from across the globe. As a news anchorperson, Elmo converses with his cousins around the world -- Elmo lookalikes dressed adorably in international costumes -- and discovers how children commemorate the holidays. In Japan, for example, children are shown flying kites and partaking in the festive "pounding of the rice," while kids in Mexico reveal how they create a pinata and use it during their holiday parties. Each segment is highlighted with an enchanting song, and other Sesame Street regulars, such as Rosita, keep viewers involved by making appearances throughout the video. Fiesta means party in Spanish, and Sesame Street is pulsating with activity in this upbeat preschool program featuring Latino songs. Jim Henson's Muppets join the fun while everyone's favorite, Elmo, learns the Conga- Wiggle dance. Maria, Rosita, and Gabi create floats and costumes; even Oscar reluctantly partakes in the festivities. The dialogue is sparse in order to devote most of the 30-minute show to singing and dancing during eight Spanish/English tunes, featuring special performances by Linda Ronstadt and Celia Cruz. Most of the music will be familiar, such as "Conga Counting Song," "Amigo," and "It Sure Is Hot." Kids will also learn greetings, familiar words, and numbers in Spanish. While some might wish for the addition of live-action scenes of Mexico or a more complex story line, the bilingual focus is solid and the ever supportive cast of Sesame Street grownups, kids, and Muppets make it a neighborhood worth visiting. By Naomi Kleinberg Elmo and Santa Grover are getting ready for the Sesame Street Christmas block party, with lots of laughs along the way. Hand in hand with other beloved Sesame Street characters, they gently teach young children a heartfelt message about the spirit of the holiday. This sturdy board book has furry red flocking on every spread, which makes the story all the more appealing to readers big and small! 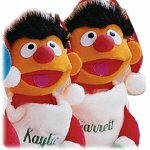 By Sarah Albee What does a Sesame Street Christmas celebrate? How about: Three French friends, two yummy cookies, a red monster up in a tree, and lots more! Sing and laugh along with this hilarious Sesame Street version of the favorite Christmas carol. This clever take on the popular Christmas carol is a must-read! Elmo sings the song "12 Days of Christmas" with a few changes. What he ends up with is a hilarious rendition. Parents can use the book to sing along or use the pictures to help children practice counting skills. By Karen McMahon It's the night before Christmas on Sesame Street the Honkers were silent, the Grouch was asleep, the count dreamed of counting, Ernie was in his stockings and Bert was in his cap, every monster lay sleeping, except a monster named Elmo. Elmo has decided to wait up for Santa to give him a very important message. Four bright, board ornaments are included in that kids can slip into the pages to complete the scenes. When they are done reading, they can hang the ornaments on their own Christmas tree. By Constance Allen Deck the halls with red and green and pink and gold and blue! 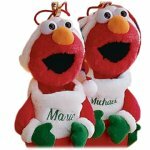 Elmo loves all Christmas colors--do you like them, too? Join Elmo as he introduces young readers to all of the magical colors of Christmas. By Christine Ferraro What would the world be like if every day was Christmas? Based on the best-selling video Elmo Saves Christmas, this Pictureback�; is filled with big, bright illustrations and lots of fun and cheer. Children will enjoy the holiday spirit as they learn, along with Elmo, why Christmas is best when we save it for that one special time of the year! Let It Snow, Elmo! The Sesame Street gang is getting ready for the holidays and enjoying winter activities. With lots of festive images to color, shiny hologramatic stickers, and a write-on/wipe-off drawing board on the back cover, this book is sure to be a holiday favorite. By Lauren Attinello Bert and Ernie carol, bake cookies, and go sledding, among other fun holiday festivities. Includes peel-and-stick stickers. By June Valentine-Ruppe Pages and pages of holiday coloring fun with all of your favorite Sesame Street characters. By Constance Allen All of "Sesame Street" is getting ready for Christmas. Why is Grover in such a hurry? Find out in this warm Christmas tale. By Liza Alexander Bundle up and get ready to take a trip to the North Pole with Big Bird. In Santa's workshop, there are rooms for making every different kind of toy in the world! Big Bird imagines visiting the North Pole at Christmas, meeting Santa and Mrs. Claus, and inspecting the workroom where elves are very, very busy. By Sarah Albee Laughter is contagious and it's spreading all through "Sesame Street" and beyond. Come laugh along with this funny Christmas tale. My two year old loves this book. We received it as a present last year for Christmas and have been reading it all year long. I know it by heart. "Next there passed some carolers singing fa-la-la-la-la. They heard the laughs, then changed their tunes to Ha-ha-ha-ha-ha." She loves this part and says it each time. It is a really cute book for a little bit of money. By Sarah Albee Hee-hee! Ha, ha ha! Laughter is contagious and it's spreading all through Sesame Street and beyond. Come laugh along in this funny Christmas tale. By Jon Stone On Christmas Eve the Sesame Street friends exchange gifts, go skating, worry about Santa, and write their wish list. By Linda Lee Maifair Big Bird finds it difficult waiting till Christmas despite his Grandmother's helpful advice. By Michaela Muntean Elmo and his Sesame Street friends help convince Oscar that Christmas is a season for warmth and sharing. (Book PLUS Audio Cassette) Elmo and his Sesame Street friends help convince Oscar that Christmas is a season for warmth and sharing. By Pat Tornborg Includes stories, poems, and instructions for Christmas projects and activities involving the citizens of Sesame Street. 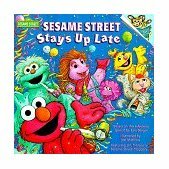 (Book PLUS Audio Cassette) Includes stories, poems, and instructions for Christmas projects and activities involving the citizens of Sesame Street. By Lou Berger Big Bird's big bash will ring in the New Year with a bang when Sesame Street stays up late for the Monster News Network's global TV party. Whether they're skiing on the slopes of Norway or munching sweet grapes in Portugal, Muppets 'round the world create a multicultural countdown to the coming year. By Gemmy Over 7 Feet tall (2.1 m). Weatherproof, everything included, for indoor and outdoor use. Self-Inflates in seconds. Everything included: stakes, tethers and fan. Easy to set-up and easy to store, simply unplug and deflate. By Kurt Adler 20" Sesame Street Elmo 3D Christmas Stocking From the Kurt Adler Christmas Collection (#K1714). An officially licensed product. This festive holiday stocking features a 3D Elmo doll on top of a red stocking. The stocking opens below Elmo's head to fill with holiday treats! Measures approx 20" tall, 6" wide. Hangs with a red twist rope that is located on top of Elmo's head. Care Instructions: Spot clean with mild detergent, do not wash.
By Kurt Adler 20" Sesame Street Cookie Monster 3D Christmas Stocking From the Kurt Adler Christmas Collection (#K1714). An officially licensed product. This festive holiday stocking features a 3D Cookie Monster doll on top of a red stocking. Cookie Monster's arms are folding in front of the stocking and he is wearing green gloves. The stocking opens below Cookie Monster's head to fill with holiday treats! Measures approx 20" tall, 6" wide. Hangs with a red twist rope that is located on top of Cookie Monster's head. Care Instructions: Spot clean with mild detergent, do not wash.
By Kurt Adler 20" Sesame Street Big Bird 3D Christmas Stocking From the Kurt Adler Christmas Collection (#K1714). An officially licensed product. This festive holiday stocking features a 3D Big Bird doll on top of a red stocking. The stocking opens below Big Bird's head to fill with holiday treats! Measures approx 20" tall, 6" wide. Hangs with a red twist rope that is located on top of Big Bird's head. Care Instructions: Spot clean with mild detergent, do not wash. Your favorite pals from Sesame Street are working with Santa to deliver your Christmas treats! Choose from Big Bird, Cookie Monster, Ernie, or Elmo. We make them extra special by personalizing each with any name, embroidered in green across the top. Stockings measure 21"tall.